For the first time, achieve superior protein yields using transient transfection and gene expression. FectoPRO®-mediated transfection process is easily scalable from a few ml to several liters of cell culture, ensuring robust reproducible protein production. Increased productivity and low DNA amount requirement make FectoPRO® a cost-effective solution for bioproduction processes. Bulk quantities are available upon request. FectoPRO® enables amazingly high protein and antibody yields in both CHO and HEK-293 cells grown in suspension in serum-free media (Fig 1). Fig. 1. FectoPRO® gives amazing antibody production yields in suspension CHO cells. Cells were seeded at 1 x 106 cells/ml in 30 ml of FreeStyle™ CHO Expression Medium and transfected with FectoPRO® (0.8 µg DNA/ml) or FreeStyle™ MAX Reagent (1.25 µg DNA/ml) following recommended protocols for the respective reagents. Recombinant mouse IgG production yield was assayed 1 to 6 days after transfection using protein G biosensor (fortéBIO® octet RED96 system). FreeStyle™ is a trademark of Life Technologies™ Corporation. Data kindly provided by ProteoGenix SAS (France). 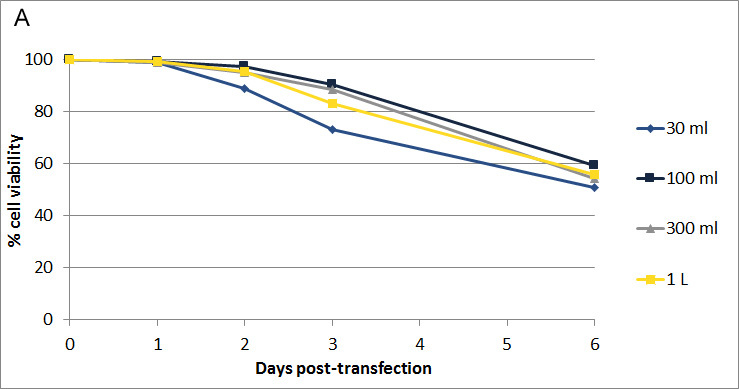 FectoPRO® largely outperforms other transfection reagents such as linear PEI commonly used in Bioproduction processes in terms of transfection efficiency (Fig. 2), leading to superior protein production yields (Fig. 3). Fig. 2. FectoPRO® gives high transfection efficiency in suspension CHO cells. 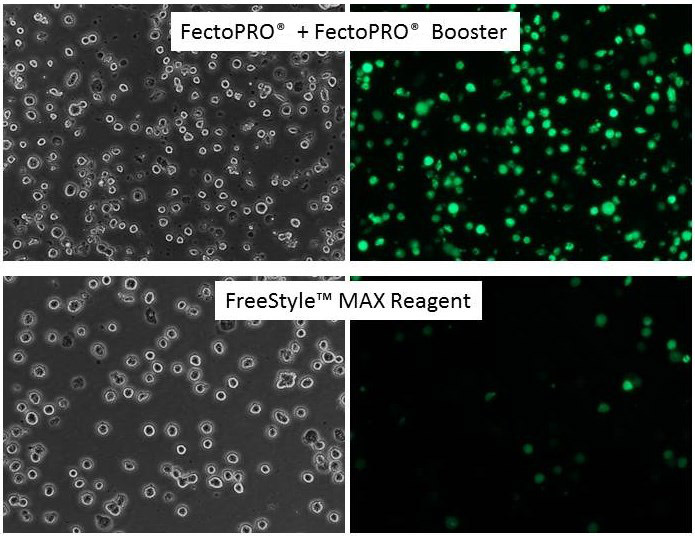 FreeStyle™ CHO-S cells were seeded at 1 x 106 cells/ml in 30 ml of FreeStyle™ CHO Expression Medium and transfected with FectoPRO® + FectoPRO® Booster or FreeStyle™ MAX Reagent using 0.4 µg/ml and 1.25 µg/ml of a GFP expressing plasmid, respectively. GFP expression was assayed 24 h after transfection using fluorescence microscopy. Fig. 3. FectoPRO® gives superior protein production yields in suspension CHO and HEK-293 cells. FreeStyle™ CHO-S and HEK-293F cells were seeded at 1 x 106 cells/ml in 30 ml of FreeStyle™ CHO or 293 Expression Medium and transfected with FectoPRO® + FectoPRO® Booster (0.4 µg DNA/ml), FreeStyle™ MAX Reagent (1.25 µg DNA/ml) or PEIpro® (1 µg DNA/ml) following recommended protocols for the respective reagents. IgG3-Fc (34 kDa) production was assayed 72 h (CHO cells) and 120 h (HEK-293 cells) after transfection by protein G affinity quantification (HPLC) and Western Blot. Standard corresponds to purified IgG3-Fc (34 kDa). High quality plasmid DNA preparation can be very costly, especially when large DNA amounts and many plasmids are required for large-scale protein production. FectoPRO® saves 40 to 60% on DNA cost by using 0.4 to 0.6 µg DNA / 106 cells / ml of cell culture; hence making this kit an affordable and economical solution for Bioproduction processes. Table 1. 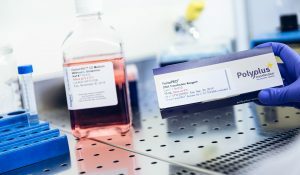 Amounts of DNA and volumes of reagent (FectoPRO® and competitor) for transfection according to manufacturers’ recommendations. The duration of protein production processes has increased in the past few years, and most of the protein production processes now last 1-2 weeks to obtain optimal amount of produced protein. FectoPRO® has been developed to ensure sustained protein production over several days, while maintaining high cell viability for longer lasting protein production (Fig. 4.). Fig. 4. FectoPRO® gives sustained protein production in suspension cells. FreeStyle™ HEK-293F cells were seeded at 1 x 106cells/ml in 30 ml of FreeStyle™ 293 Expression Medium and transfected with FectoPRO® + FectoPRO® Booster (0.5 µg DNA/ml) following the standard protocol. IgG3-Fc production was assayed after different timepoints by protein G affinity quantification (HPLC). Similar results are obtained with FreeStyle™ CHO-S (data not shown). Streamline your bioproduction process with a robust protocol that is easily adapted to various culture vessels. 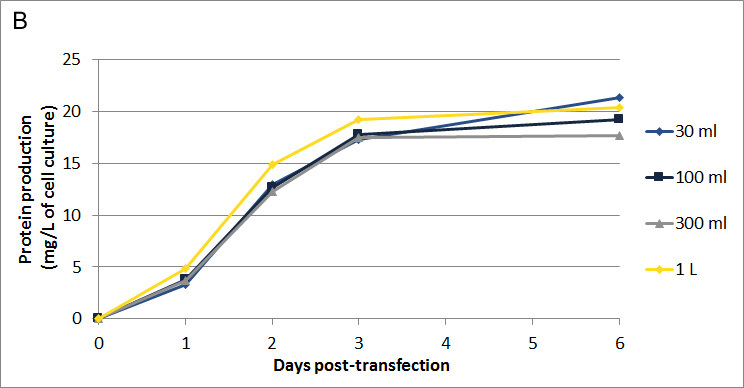 FectoPRO®-mediated transfection can be scaled linearly from 30 ml up to liters of cell culture without protocol adaptation (Fig. 5.). Fig. 5. FectoPRO® is easily scalable and reproducible in CHO cells. FreeStyle™ CHO-S cells were seeded at 1 x 106 cells/ml in 30 ml, 100 ml, 300 ml or 1 L of FreeStyle™ CHO Expression Medium and transfected with FectoPRO® + FectoPRO® Booster (0.5 µg DNA/ml). 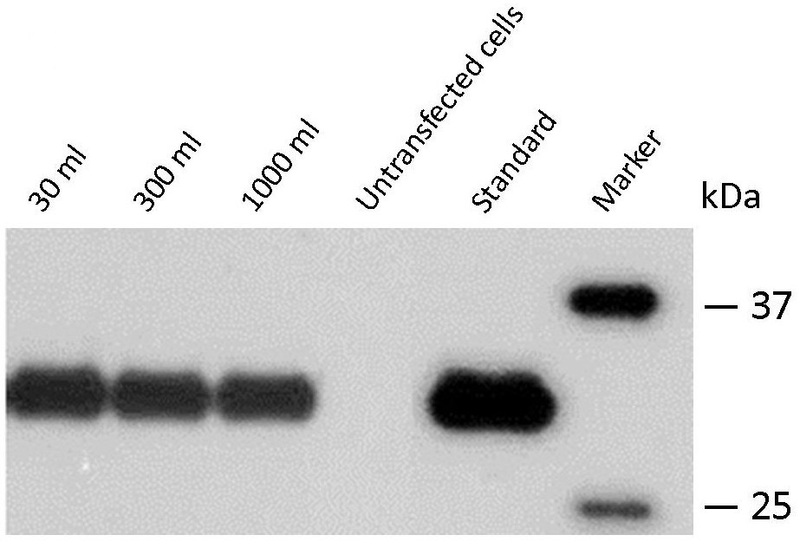 At day 1 to 6, cell viability was assayed using Trypan blue exclusion assay (A) and IgG3-Fc production was assayed by protein G affinity quantification (HPLC) (B) and Western Blot (C). 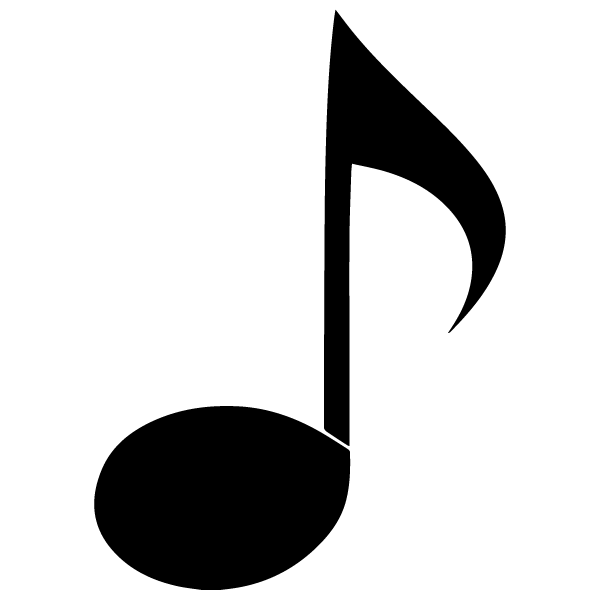 Standard (C) corresponds to purified IgG3-Fc (34 kDa). FectoPRO® is manufactured and formulated using a highly controlled production process. This ensures highly reproducible results from experiment to experiment. 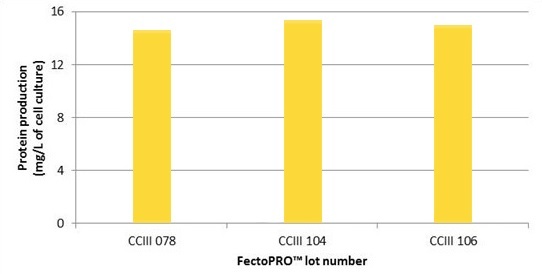 Moreover, in order to meet current regulatory guidelines, FectoPRO® is released using advanced quality controls including a specification for protein productivity that guarantees excellent lot-to-lot consistency (Fig. 6). Fig. 6. FectoPRO® gives excellent lot-to-lot reproducibility. Suspension CHO cells were seeded at 1 x 106 cells/ml in 30 ml of CHO medium and transfected using 3 different lots of FectoPRO® (CCIII 078, CCIII 104 or CCIII 106) following the standard protocol. 72 h after transfection, IgG3-Fc production was assayed by protein G affinity quantification. Similar results are obtained on suspension HEK-293 cells (data not shown). Unlike other commercially available reagents, FectoPRO® transfection kit is suitable for both CHO and HEK-293 cells (Fig. 2 and 3). The reagent is compatible with various media formulations; hence lab implementation is easy and straightforward (Fig. 7, Table 2). Fig. 7. FectoPRO® gives superior protein production yields in suspension CHO cells grown in different media. 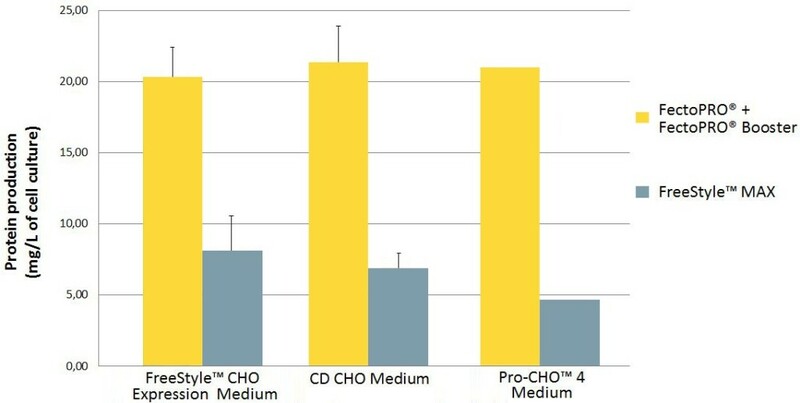 CHO cells were seeded at 1 x 106 cells/ml in 30 ml of FreeStyle™ CHO Expression Medium, CD CHO Medium or Pro-CHO™ 4 Medium and transfected with FectoPRO® + FectoPRO® Booster or FreeStyle™ MAX Reagent following recommended protocols for the respective reagents. IgG3-Fc production was assayed 72 h after transfection by protein G affinity quantification (HPLC). Table 2. 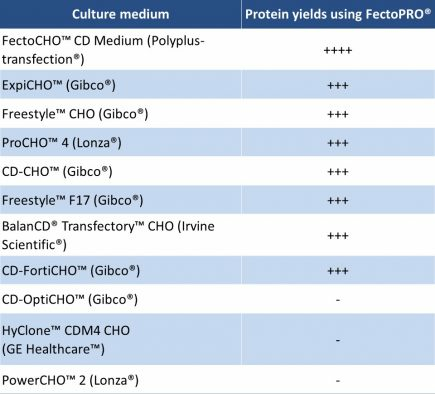 Protein yields using FectoPRO® in different culture media for CHO cells. Table 3. 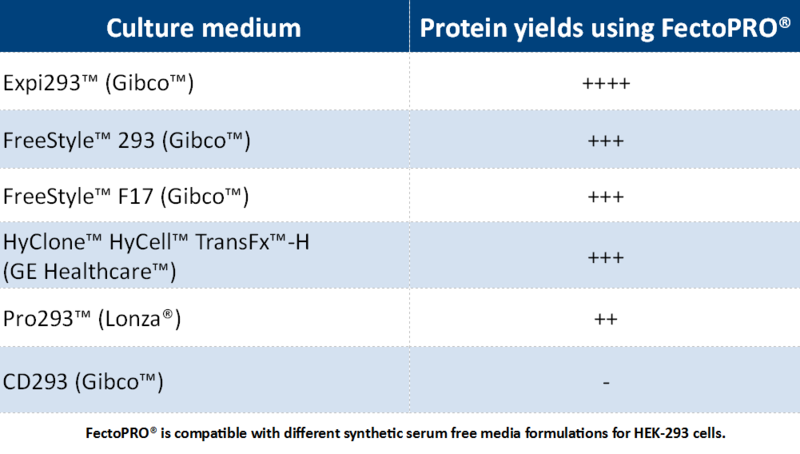 Protein yields using FectoPRO® in different culture media for HEK-293 cells. FreeStyleTM, CD FortiCHOTM, CD OptiCHOTM, Expi293TM, ExpiCHOTM and CD293 are trademarks of Gibco®. Pro-CHOTM, PowerCHOTM and Pro293TM are trademarks of LonzaTM Group. HyCloneTM, HyCellTM and TransFxTM are trademarks of GE HealthcareTM. BalanCD® and TransfectoryTM are trademarks of Irvine ScientificTM. FectoPRO® is also perfectly suited for virus production. If you have any questions regarding FectoPRO®, please visit our dedicated Frequently asked questions or contact us at support@polyplus-transfection.com. Protein production consists in overexpressing a recombinant protein or peptide in a cell line at small / medium to large scale. The biomolecules produced can be used for research purposes like structural characterization all the way down to therapeutic or medical applications. Recombinant protein production for therapy and diagnostic applications is mainly achieved using HEK-293 and CHO cells cultivated in suspension cultures without serum. The latter has been removed from raw materials for various reasons (costs, downstream purification steps, reproducibility…) while culture in suspension has been implemented to increase productivity. Improvements in culture processes and cell line engineering led to the generation of high-density mammalian transient protein expression systems. Cupo, A., Cruz Portillo, V. M., Gelfand, P., Yasmeen, A., Klasse, P. J., Moore, J. P. (2019). Optimizing the production and affinity purification of HIV-1 envelope glycoprotein SOSIP trimers from transiently transfected CHO cells, PLoS ONE 14(4), doi: 10.1371/journal.pone.0215106. Carravilla, P., Chojnacki, J., Rujas, E., Insausti, S., Largo, E., Waithe, D., Apellaniz, B., Sicard, T., Julien, J. P., Eggeling, C., Nieva, J. L. (2019). Molecular recognition of the native HIV-1 MPER revealed by STED microscopy of single virions, Nat Commun 10 78, doi: 10.1038/s41467-018-07962-9. Cooke H.A., Arndt J., Quan C., Shapiro R.I., Wen D., Foley S., Vecchi M.M., Preyer M. (2018). EFab domain substitution as a solution to the light-chain pairing problem of bispecific antibodies. MABs, doi: 10.1080/19420862.2018.1519631. Tveriakhina, L., Schuster-Gossler, K., Jarrett, S. M., Andrawes, M. B., Rohrbach, M., Blacklow, S. C., Gossler, A. (2018). The ectodomains determine ligand function in vivo and selectivity of DLL1 and DLL4 toward NOTCH1 and NOTCH2 in vitro, Elife 7, doi: 10.7554/eLife.40045. Toczydlowska-Socha, D., Zielinska, M. M., Kurkowska, M., Astha,, Almeida, C. F., Stefaniak, F., Purta, E., Bujnicki, J. M. (2018). Human RNA cap1 methyltransferase CMTr1 cooperates with RNA helicase DHX15 to modify RNAs with highly structured 5′ termini, Philos Trans R Soc Lond B Biol Sci 373, doi: 10.1098/rstb.2018.0161. Lu, J., Wang, R., Xia, B., Yu, Y., Zhou, X., Yang, Z., Huang, P. (2018). Potent Neutralization Ability of a Human Monoclonal Antibody Against Serotype 1 Dengue Virus, Front Microbiol g 1214, doi: 10.3389/fmicb.2018.01214. Darricarrere, N., Pougatcheva, S., Duan, X., Rudicell, R. S., Chou, T. H., DiNapoli, J., Ross, T. M., Alefantis, T., Vogel, T. U., Kleanthous, H., Wei, C. J., Nabel, G. J. (2018). Development of a Pan-H1 Influenza Vaccine, J Virol, doi: 10.1128/JVI.01349-18. Chen, Y. H., Narimatsu, Y., Clausen, T. M., Gomes, C., Karlsson, R., Steentoft, C., Spliid, C. B., Gustavsson, T., Salanti, A., Persson, A., Malmstrom, A., Willen, D., Ellervik, U., Bennett, E. P., Mao, Y., Clausen, H., Yang, Z. (2018). The GAGOme: a cell-based library of displayed glycosaminoglycans, Nat Methods, doi: 10.1038/s41592-018-0086-z. Moyo, T., Ereno-Orbea, J., Jacob, R. A., Pavillet, C. E., Kariuki, S. M., Tangie, E. N., Julien, J. P., Dorfman, J. R. (2018). Molecular basis of unusually high neutralization resistance in tier 3 HIV-1 strain 253-11, J Virol, doi: 10.1128/JVI.02261-17. Lena Tveriakhina, Karin Schuster-Gossler, Sanchez M. Jarrett, Marie B. Andrawes, Meike Rohrbach, Stephen C. Blacklow, Achim Gossler (2018).The ectodomains determine ligand function in vivo and selectivity of DLL1 and DLL4 toward NOTCH1 and NOTCH2 in vitro, eLIFE, doi: 10.7554/eLife.40045. Batonick, M., Kiss, M.M., Fuller, E.P., Magadan, C.M., Holland, E.G., Zhao, Q., Wang, D., Kay, B.K., Weiner, M.P. (2016). pMINERVA: A donor-acceptor system for the in vivo recombineering of scFv into IgG molecules, J Immunol Methods, doi: 10.1016/j.jim.2016.02.003. Ferreira de Freitas, R., Eram, M. S., Smil, D., Szewczyk, M. M., Kennedy, S., Brown, P. J., Santhakumar, V., Barsyte-Lovejoy, D., Arrowsmith, C. H., Vedadi, M., Schapira, M. (2016). Discovery of a Potent and Selective Coactivator Associated Arginine Methyltransferase 1 (CARM1) Inhibitor by Virtual Screening, J Med Chem, doi: 10.1021/acs.jmedchem.6b00668. Li, M., Yang, S., Xu, D. (2016). Heparan Sulfate Regulates the Structure and Function of Osteoprotegerin in Osteoclastogenesis, J Biol Chem, doi: 10.1074/jbc.M116.751974. Cupo et al, 2019, doi: 10.1371/journal.pone.0215106. FectoPRO® is compliant with biomanufacturing guidelines. Indeed, FectoPRO® is guaranteed free of animal-origin components, and is chemically defined. Systematic lot management and release testing is performed for each lot produced. Furthermore FectoPRO® transfection kit undergoes advanced quality controls: protein productivity, cell viability, and complete sterility. 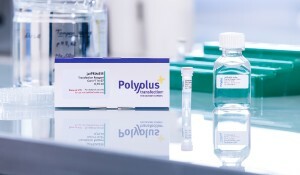 In addition, Polyplus-transfection® is ISO 9001 Quality Management System accredited since 2002; this level of certification assures global customers that the supplier has established reliable and effective processes for product development, manufacturing, sales and customer support.